Most designers want to pull their hair out when clients do not pay, have unfair revisions for less pay or asks to put a black font on a black background. The battles with сlients from hell can be painful. Once it starts, it seems never end! Here are ten tips to help you prevent design clients from hell so you can protect your time and save money. You may think you always get great clients, so why bother with lengthy paperwork and contracts? Design clients need to know what you are worth and what makes up in the billable hour or flat rate. Small projects may come and go, but what about long-term projects where the stakes are higher? You need to protect your rights as a designer, by having a contract in place before you start the job. Straightforward and definite agreements help both designers and clients to be on the same page. You may be the ‘pay after work is done kind of person’ or maybe you are down with 50% deposit to start, and 50% after the project ends. 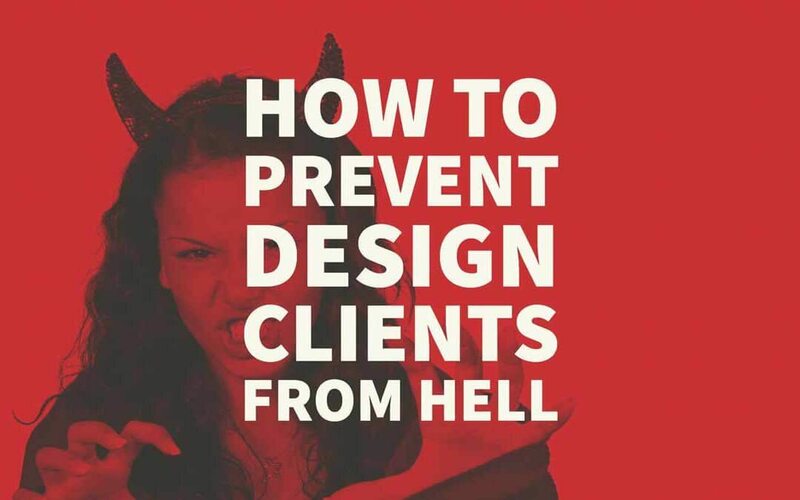 While these may work for great clients, it may not work for clients from hell. You need to be professional and ask for an upfront fee before starting any work. If you are sceptical about this approach, then consider this. For the design industry, asking fees upfront is a common practice. Without it, you are stuck with work and clients who use your skills, potentially without paying you. Here’s a great post if you want to know how to get clients to pay you up front. Designers can find customers from so many avenues. Platforms like Upwork may get you connections, but the conversation is limited to messages. While messaging is always a good way to document your conversation, there is something about a video meeting that gives you more information that text. When you have an initial meeting with a potential design client, you can look out for visual cues to help you gauge how it may look to work with this client on a long-term basis. Find red flags by a simple video call and end the relationship before it begins. Red flags are sure signs that tell you up front this may be a client from hell. One of the best ways to prevent working with clients from hell is to identify these red flags. For instance, during your initial conversation or video meeting, observe the way your client bargains. This is a standard red flag because such customers do not value your work as they should. This holds true for clients who refuse to pay upfront or give you a deposit to start the work. Clients from hell also set unrealistic deadlines, keep complaining about every aspect of your job or have no idea what they want. You found a potentially great client, the work is good, and the pay is even better. You are all set for your initial meeting, and you are pumped to start working on the job. However, things can go downhill if you missed asking or getting valuable information on the project. You are risking many hours of work and even more rework if you are not clear about the job, to begin with! Creativity thrives within boundaries, and a detailed brief is your boundary. You do not want to be stuck with wrong choice or worse, a client from hell. Be sure to research about the customer, Google and check out their social media pages to prepare your questions. Here are great questions by Canva for an effective design brief. Once you get your detailed brief if you realise this is not what you want to do. Maybe you prefer working on brochures than a logo design or creating presentations. Maybe you want to take it up just to cover your expenses. Maybe it is a friend who wants you to work for free. In the long run, it is always better to say no. There could be many other reasons you want to say no to that haggling client, promises of future work kind of client, etc. When you have a gut feeling about the customer, or you can see the red flags dangling over them, just say no to prevent working with design clients from hell. Some clients do not want to learn the ropes of new technology and prefer to discuss everything on call or text messages. These are the type of clients from hell who can twist the story to their benefit as snatching candy from a baby. Make sure you document every conversation you have about your work even if it means you have to send a follow-up email after every call or chat. Doing this will give you leverage over any payment related disagreements later. If you have a client who abusive, then you can put your foot down and prefer to work on email communications instead too. If you prefer providing your design services for a flat rate, you can risk working on extra time that ends up being worth less than you hoped for. If you work on a retainer or an hourly basis, you must use a robust tracking system for every client, project and daily tasks. Doing this manually is an uphill task, not to mention an ineffectual use of your productive time. Don’t waste your time on spreadsheets, use apps tailored to your needs. If your work on your own, or with the team, time tracking apps boost your productivity and also serves as sufficient documentation for invoicing purposes. Sometimes you run into a client that is a decision maker representing the company. This is the kind of client from hell who takes what you worked on for the company and brings back feedback. For a decision maker, this customer can be very indecisive. If you happen to chance on working with such a client, add a little effort to offer ready alternatives to hasten the decision-making process. This way you can save your time and end contract if it causes you to lose more money than you’re able to make. As an entrepreneur or freelance designer, there may be the period of a dry spell. The time where you find yourself with little or no work. There may come a point where you want to take up anything that comes your way just to float above water. Clients from hell can smell your desperation from a mile away. Some of them will routinely give you urgent work that was needed yesterday. If it happens once in a blue moon, that is understandable, but don’t let them trample all over you repeatedly. When you have a such a client, politely but firmly let them know you will charge rush fees to the invoice and give them a number. If they agree, then you make more money, if they do not, that is less hassle for you to deal with! This is particularly the case for designers who have a short fuse. If you lose your temper quickly, one of the best ways to prevent clients from hell if to avoid any communication while you are angry. Any email answered in haste can backfire. Being racist, sexist, or offensive in any manner of your communication will give a bad reputation. Clients from hell know how to twist documentation to their benefit. In emails and chats, your tone can be miscommunicated so remember to be polite and keep every conversation respectful even if that is not what you receive from the client from hell. Doing this will make sure you were the wiser one in your battle with the client from hell. Here is helpful advice about email etiquettes you need to know as a freelancer and design client. Many times, the ball is in your court. You can decide if you want to work with a client from hell at the beginning of your email or phone conversations. Face your fear of saying NO to such customers and ending the contract before you lose time, money and much before it hurts your reputation. Author Bio: Alice Clarke is a marketing expert and an experienced writer at Top australian review service. She believes in the driving force of self-development and positive psychology.